Last week, after Brian's graduation from preschool, we went to one of his friend's house for a playdate! There were a bunch of his classmates there and they were all having a great time playing while the Moms were hanging out enjoying actual conversation. Like real grown up talking. A novelty when you have young kids. But, I digress. At one point during the party I noticed Brian's cheeks were very red - my gut told me something was up, but I blew it off and told myself that he must be hot. We got home and headed to the shower. When I took off his clothes, I was shocked. He was red and scaly everywhere! His entire body. And his skin felt like leather. Totally bizarre. I gave him the shower and slathered him with coconut oil, my moisturizer of choice, and decided this must be some type of allergic reaction. Thankfully, he wasn't itchy or showing any worrisome symptoms. Two days later, there was little to no improvement. Actually, it was looking like it was turning into something else in addition to the rash. He looked like he had goosebumps everywhere. 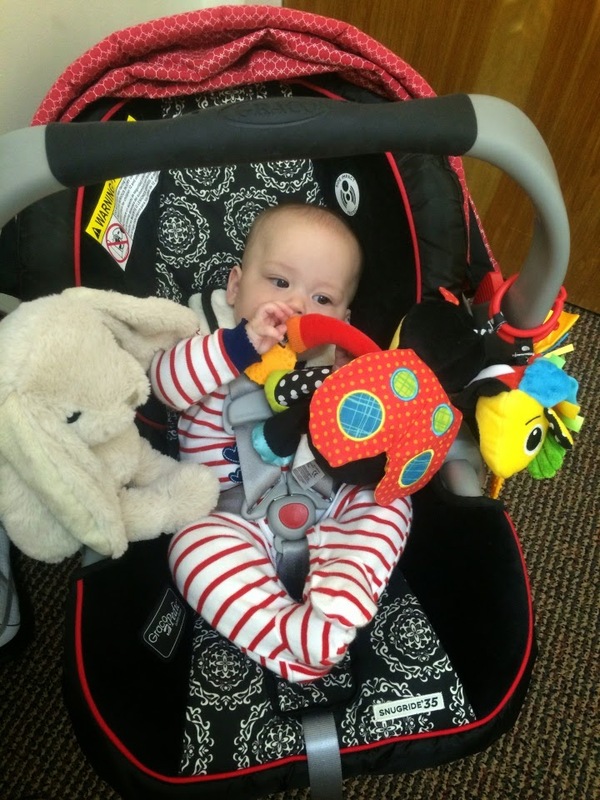 So off to the pediatrician we went. He said we were dealing with two things - a contact allergy and Keratosis Pilaris. I racked my brain about the contact allergy. Our friends have a dog - but Brian had never tested positive for a dog allergy. I questioned him about what types of things his group of friends were playing that day - and I immediately thought I had an answer. He said that they were using his friend's comforter to hide under and use like a "fort" - basically, he was rolling around on the fabric. (My apologies to my friend!!) I called her to ask if I could steal a sample of her laundry detergent. I was convinced that was part of the problem. Since Gavin, we have only ever used Dreft. And we never have any scented products in the house. 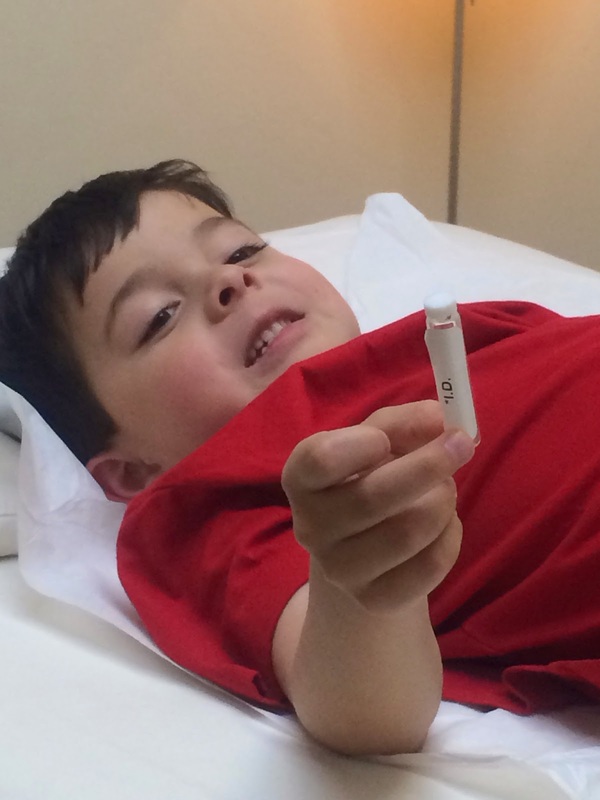 Gavin had eczema (and Brian has patches of it, too) - and kids who have eczema can be prone to asthma. Scented products can exacerbate both. Gavin also had contact dermatitis. So if you were to hold him against your shirt that you washed in Tide or All or any other detergent that was strong and scented - he would instantly break into a rash. I decided to make an appointment with Dr. Kang, our acupuncturist. She is the doctor that taught me how to (successfully) eliminate Brian's peanut allergy - I knew she'd be able to help me get to the bottom of this. If you are new here - you should know that I rarely believe anything is forever. If it says a condition takes years to resolve - or will never go away - or that you'll need toxic medication or cremes - I just don't believe it. I suppose that mentality comes from mothering Gavin. I refused to believe things like "he'll never" or "he won't be able to" or "he'll probably not" for any milestone. I always believed that Gavin would do everything. I didn't know when - but holding onto that hope kept me positive and motivated to help him. Along the journey, I met incredible complementary healers like Dr. Kang (Acupuncture) ... and Dr. Trish (Energy Healer) ... and Dr. Thompson (Nutrition). When Gavin was a baby and was getting physical therapy I had a bit of a breakthrough. I thought the therapist and the therapy was great and necessary - but I wanted to get to the root of why he needed therapy to begin with. And I knew it started in his brain. I had to figure out how to heal his brain. That is what led me to google which led me to research which led me to Dr. Thompson. Over the years, she helped me slowly heal Gavin's brain (and many of his skin conditions!) through nutrition. While waiting for Brian's appointment with Dr. Kang, I wrote to Dr. Thompson asking her for her thoughts. She knew that this was an "inside job" too - and said that often things like this erupt when there deficiencies of Vitamin D and A. She told me to give Cod Liver Oil to Brian - it has both D and A. And she told me to add healthy fats to his diet. I'm doing both - and I also added Nordic GLA to the regimen (Borage oil). Brian is just like his brother - tough as nails. He doesn't like the cod liver oil that much (does anyone?) but he takes it because he knows it's good for him - and it will help him. Dr. Thompson also told me to stick with the Coconut Oil on his skin. Sometimes I switch back and forth to Aquaphor, but she said that Aquaphor is not good for kids with Keratosis Pilaris. Since it is "petroleum based" it can actually clog the pores and contribute to the "keratosis." Yesterday was our standing appointment with Dr. Trish. She treats Brian AND Hope every Wednesday afternoon. She has been instrumental in helping Brian navigate through his grief. Hope is a peaceful, happy baby who breastfeeds well, is rarely fussy and sleeps beautifully. I am sure that Dr. Trish's treatments have much to do with that. So at our appointment I told her what we were dealing with and we discussed that it really is no coincidence that Brian has been having a more difficult time with his grief recently. (Not anything drastic or dramatic - just talking about Gavin and feeling sad more than usual) What's going on inside your body - and with your emotions - can manifest itself physically. I hope you're as fascinated by this stuff as I am. Either that or you're bored out of your mind. I feel very grateful that I have these wonderful doctors and women to learn from. I got on the table - on my back - and put my right arm straight up in the air. She tried to push it down... but I was strong enough to keep it in the air. Next she had me hold a sheet of my friend's fabric softener. I kept my strength. This meant that my body was in balance - and not reacting to the fabric softener. Then I acted as a surrogate so she could test Brian through me. He held the fabric softener and then held my left hand while Dr. Kang tried to push down my right arm. I kept my strength. So we knew it wasn't the fabric sheet. Next was the laundry detergent. She tested me first - I kept my strength. Then Brian held the dish with the soap in one hand while he held my left hand with his other hand. Dr. Kang pushed my arm down and I had ZERO strength. Bingo. Just as I suspected. He was sensitive to the detergent. Dr. Kang suspected that the underlying cause of all of this was an immune deficiency, so she tested him for that next. She gave me a little vial that represented the energy of immune deficiency and I held it in my left hand while she tried to push down my right arm - I kept my strength. Then she had Brian hold the vial - hold my hand - and, once again, I had ZERO strength. Lots of things can cause an immune deficiency. And an immune deficiency can trigger an allergic response. It can be caused by food, chemicals, environmental and/ or emotional allergies. It appears for Brian that it was a combination of emotions and chemicals. To treat Brian, she had him lay face down on the table - holding the vial representing "immune deficiency" in his hand. She massaged using a tapping "percussion like" technique up and down both sides of his spine and down his legs. He LOVES this and is so cooperative. Even taking big, dramatic deep breaths when instructed. It's adorable. Next, she respectfully asked him if he would prefer acupuncture (with needles) or acupressure. He chose acupressure. He had gone to this appointment willingly knowing that he might get acupuncture and he was okay with that. I wanted to completely respect his boundaries around going to Dr. Kang. Her office was the last place that we were the day that Gavin had his "incident." We were there to discuss how I could begin to eliminate Gavin's seasonal allergies - and Brian was getting his first acupuncture treatment. Gavin started to act funny and I cut the appointment short to take him across the street to the doctor... but when it turned out that they were at lunch I made the split second decision to take him to the emergency room. We all know what happened after that. *sigh* So, if Brian didn't want to go today - I would have 100% respected that. He likes Dr. Kang a lot - and he was fine about going. and he laughed his way through the treatment. After that, Brian had to lay on the table holding the vial for twenty minutes. He was so cooperative. We talked and told stories to pass the time. Dr. Kang came back in and told me to use the juice of freshly cut Ginger on his skin - twice a day for three days. I am also to place the laundry detergent my friend gave me (the one Brian reacted to) in a sealed glass jar - put it in the back waistband of his pants as he lays on his belly - and massage his back the way she did. This is the exact technique I used to eliminate his nut allergy... which I did every single day for a little less than six months to slowly desensitize his body to that allergen. Massaging down both sides of his spine while the detergent is near his skin (but not touching him) will desensitize him to it... while also boosting his immunity. It will also mean that Brian shouldn't have any issues when he's around other people's detergents! Happy day! I know this probably all sounds wacko - but trust me, it has worked for us. 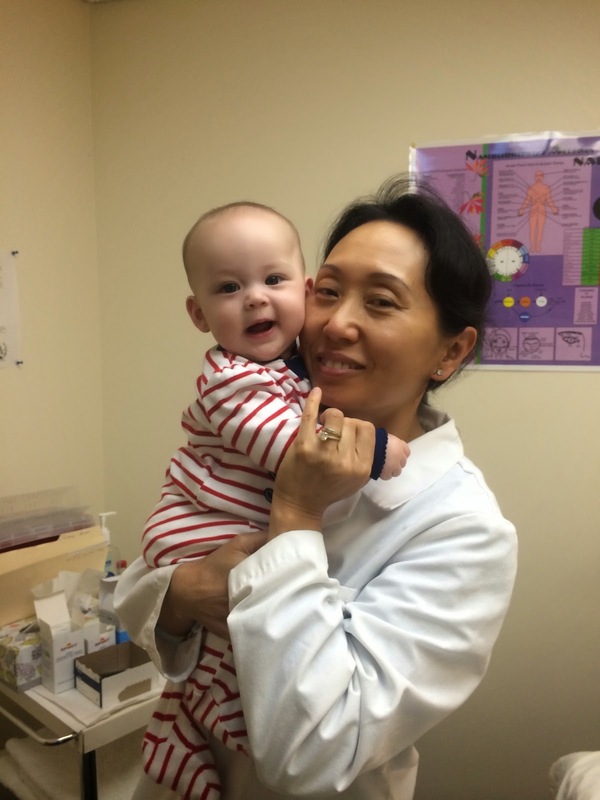 Dr. Kang is incredible - and we have learned so much from her. She was so happy to see Hope today! I will keep you posted with his progress - but I fully expect this issue to completely resolve! Once it does, I'll keep him on the Cod Liver Oil and GLA - and use the Coconut Oil on his skin - because all of that is good for him anyway. Dr. Thompson also recommended that I get him a zinc based sunscreen - and to use clothes more than sunscreen. "Sunscreen is just chemical clothing," she told me. I never thought of it that way. The last week has had me in "fixer" mode - which is how I spent most of Gavin's life. I was back to researching and alternative healing and more. I can't help but wonder if this little hurdle that was so abruptly thrown into our world was designed for me and Brian - as part of our healing journey. Very interesting. Please keep us posted on how it all works out with Brian's rash & desensitizing him to the detergent. I am looking at getting an acupuncturist to help me with sciatic issues - I'm lost how to find a "good" one - any tips on what to look for? That is totally awesome Kate. Hey did you know that coconut oil can be used as sun screen too? It's not a real high SPF but does help. I look forward to hearing how things go for Brian. This is really fascinating!! I often think that there must be alternatives to traditional medicine and drugs. Does this help your arthritis? I'm really hoping to find something to help mine. I find this very fascinating and not at all boring! Many years ago (15 or so ) while visiting my parents in Florida, I went to my mom's doctor, who is a gp and nutritionist. My mom suffered from CFID and I have a kidney disease. Anyway, she did some muscle testing, when I mentioned that I drank diet soda she had me put my arm up with nothing in my hand and tried to push it down, it stayed up. She then put a can of diet coke in my hand and pushed, my arm went down hard. Needless to say, I have never drank diet soda again! I would love to see a acupuncturist, energy healer and nutritionist, but unfortunately I can't afford it, since my insurance won't cover them. It infuriates me that they will cover see doctors and medicines that are full of chemicals that can be harmful, but not holistic doctors that prescribe natural healing are not covered. Please keep us updated on Brian. Thanks for the interesting blog, I always enjoy your blogs. You and your family is terrific! We ditched the Dreft and went to Charlie's Soap once we started cloth diapering, and found it to be even better for our eczema people. In case you want to make the leap to Charlie's in the meantime. Seems like you have an awesome acupuncturist! I really enjoyed this post. Very interesting. Thank you. Your acupuncturist is amazing! I do believe very much like you that most things are temporary. I have 3 children that have keratosis pilaris and I use coconut oil daily. They also take fish oil and vitamin D.
I hope that Brian's immune system gets stronger and no more issues with laundry detergents. I only use plant based laundry detergents and they work a lot better! I've never commented on your posts before, but have been following for the past year. I LOVE hearing about alternative medicine. My family has seen amazing benefits from changing our diets (the kind of changes that medical doctors have told us is impossible without medication) and now we treat almost all our ailments through holistic means. I'm completely convinced that nature has provided us the way to cure our diseases, just we haven't found them all yet. Please do keep us updated on Brian's progress, and thank you for sharing your beautiful family! Thanks for sharing your life with all of us. I have been following you since before Gavin passed away and just love reading about your family. The only suggestion I have is the same as the previous poster, read more about Dreft, it is full of chemicals including crushed glass and formaldehyde. My husband has terrible allergies and we switched to Norwex (all natural cleaning products) detergent and he hasn't had a rash in 2 years. Just a thought.